New treasure hunting adventure Action Jack from IGT is out now and the only place you can play it on your PC, laptop, tablet or mobile is at Coral Casino. To find the lost riches, you’ll have venture deep into the virtual jungle. With 5 reels and 40 paylines, the reels include many images typically found in this genre of slot. As well as royal values, you’ll see treasure maps, waterfalls, a palace, a gemstone and a miniature icon. Top of the payers is the volcano which can erupt to deliver payouts of up to 25 times your stake per payline. Helping to create those winners is Action Jack himself who is the wild. The standard symbols and the wild can land fully stacked. These stacked symbols can also sync so you’ll see matching symbols on multiple reels which can deliver some cracking combinations. Those synced reels aside there isn’t a huge amount to report about the base game. It’s Action Jack’s Free Spins Bonus feature where this slot can really explode into life. Landing 3, 4 or 5 scatters pays 3, 10 or 25 times your total stake. It also awards 20, 40 or 60 free spins. Any winnings you hit from those free spins benefit from a 3x multiplier and are trebled. Multiple retriggers are available with a massive 500 free spins to be won in total. IGT has kept things pretty simple in Action Jack. The visuals aren’t quite up to Premier League standard but they do the job well enough. It’s a similar story with the gameplay which isn’t overly fussy but can still deliver some pretty good action, especially when you trigger the Free Spins Bonus feature. The trebling multiplier can really come into its own here – up to 3,000 times your stake on each free spin. If you like the treasure hunter theme, then you should find plenty to like journeying with Action Jack. 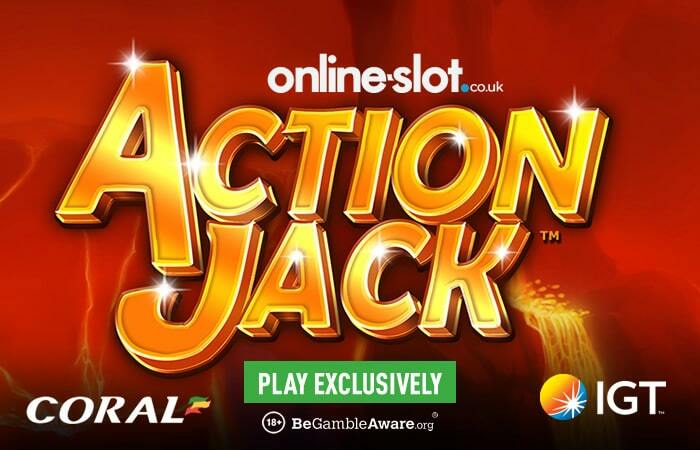 Action Jack is available exclusively at Coral Casino. If you’ve never played at Coral Casino before, then you’ll be eligible for an exclusive welcome package – deposit just £10 to get 50 free spins, with no wagering requirements, to use on a choice of 5 Age of the Gods series slots.